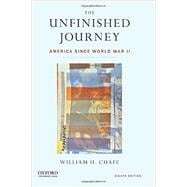 Brilliantly written by a prize-winning historian, The Unfinished Journey, Eighth Edition, considers both the paradoxes and the possibilities of postwar America. William H. Chafe portrays the significant cultural and political themes that have colored our country's past and present, including issues of race, class, gender, foreign policy, and economic and social reform. He examines such subjects as the Vietnam War, the civil rights movement, the origins and the end of the Cold War, the culture of the 1970s, the rise of the New Right, the events of September 11th and their aftermath, and various presidencies. William H. Chafe is Alice Mary Baldwin Professor of History at Duke University. He is the author or coeditor of several books, including A History of Our Time: Readings on Postwar America, Eighth Edition (OUP, 2011) and The Rise and Fall of the American Century: The United States from 1890-2009 (OUP, 2009). He is a former president of the Organization of American Historians and his books have been recognized with the Robert F. Kennedy Book Award (1981), the Sidney Hillman Book Award (1994), and the Lillian Smith Book Award (2003).